In 2015, FWC and other agencies partnered with the University of Georgia and Joseph W. Jones Ecological Center to begin “The South Florida Deer Research Project” in Big Cypress National Preserve (BCNP) and Florida Panther National Wildlife Refuge (FPNWR). One of the main objectives of the study is to understand how hydrology, fire and predators impact deer populations in the unique South Florida system. To date, the team has captured close to 300 deer and fitted 263 adult deer with GPS radio-collars, yielding over 548,000 locations. In addition, three camera grids containing a total of 180 remote-sensing cameras were deployed to monitor deer and other species. Thus far, the team has recorded and cataloged over 360,000 photos. The study was designed to include four years of field work in an effort to capture seasonal and annual fluctuations in weather, predation, and hunting pressure. However, none of us would have expected to capture the weather extremes we have thus far! In winter 2016, a normally dry season turned into a record-breaking high water event. By February the water stage was over 12 inches above normal and exceeded the prior winter flood record of 1995. We documented unusual deer movement activity, for example, the number of deer detections in our camera grid in FPNWR more than doubled as deer from lower elevations moved to higher ground. Luckily, the duration of the winter 2016 high water event did not last as long as it had 1995. January in Florda is typically in the middle of the dry season. However, in 2016, an unusual amount of rain caused record flooding throughout our study area. 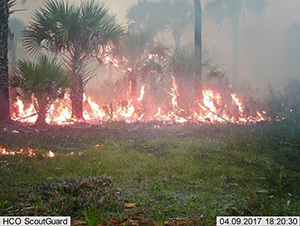 In March 2017, one of the largest wildfires in Florida started in BCNP. It would eventually burn over 21,000 acres, including an area that contained one of the project’s camera grids and numerous collared deer. No mortalities of collared deer occurred due to the fire and interestingly, deer stayed within their established home-ranges as the woods around them burned. Furthermore, collar data demonstrated deer in proximity to the burn moved into the burned landscape shortly after. June 2017 brought another flooding event; more rain fell in three days (over 15 inches) than had in the previous 36 weeks, breaking another record. In some areas of BCNP, the water level rose five feet in three days. Just two days after the large Cowbell Fire burned through much of North Addition Lands, one of the GPS-collared female deer emerges from the burn with another deer. The most recent event, Hurricane Irma, just occurred. The eyewall of this massive hurricane came within 25 miles of our study site. 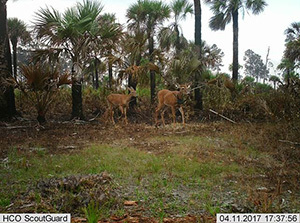 None of the collared deer died during the hurricane, and preliminary data indicate some that deer moved into pine flatwoods and tropical hammocks, but overall movement rate did not decrease during the storm. These “record-breaking” events make field work difficult, but they give us insight into impacts of weather extremes that may become more common in the future. The data gathered, both through telemetry and remote cameras, will allow us to analyze how these extreme events impact deer survival, movement, habitat use, and recruitment of fawns, and other aspects of deer ecology. In addition, although the study is focused on white-tailed deer, the cameras capture all wildlife that use these areas, allowing us to examine the effects of extreme weather at a community level. 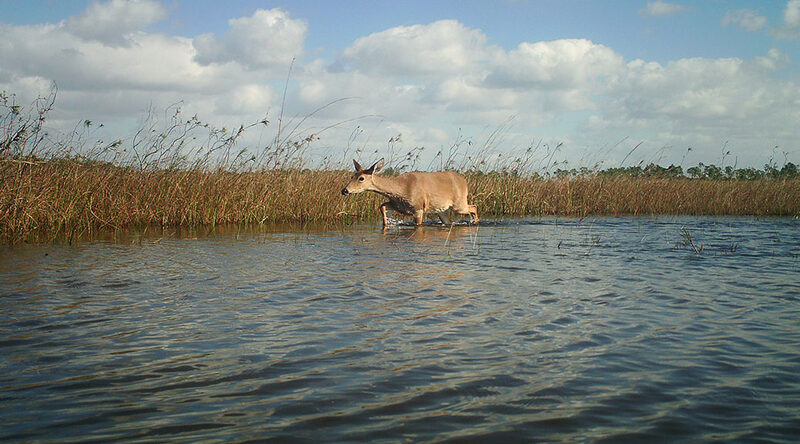 For more information and quarterly updates, please visit the South Florida Deer project website.